Two different crucifixes, or strictly wooden corpus figures for crucifixes, are attributed to the High Renaissance master Michelangelo, although neither is universally accepted as his. Both are relatively small figures which would have been produced in Michelangelo's youth. One is a polychrome wood sculpture possibly finished in 1492 which had been lost from view by scholars until it re-emerged in 1962; in 2001 new investigations appeared to confirm the attribution to Michelangelo. It was perhaps made for the high altar of the Church of Santa Maria del Santo Spirito in Florence, Italy. The work is especially notable for the fact that this Christ is naked. Michelangelo Buonarroti was a guest of the convent of Santa Maria del Santo Spirito (Florence) when he was seventeen years old, after the death of his protector Lorenzo de' Medici. Here he could make anatomical studies of the corpses coming from the convent's hospital; in exchange, he is said to have sculpted the wooden crucifix which was placed over the high altar. 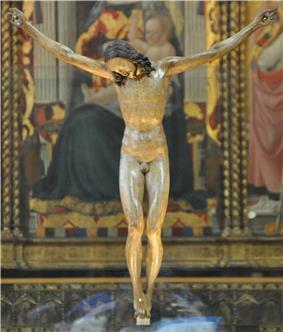 Today the crucifix is in the octagonal sacristy of the Basilica of Santa Maria del Santo Spirito. The sign attached to the cross includes Jesus' accusation inscribed in Hebrew, Greek and Latin. The wording translates "Jesus of Nazareth King of the Jews". All of the evangelists record this inscription, which varies slightly among them. Here the artist favored the rendering from John's Gospel (John 19:19). Also present is the spear wound inflicted into Jesus’ side by a Roman soldier. His blood is seen here dripping from the wound on his right side. In December 2008, the Italian government acquired from the antique dealer Giancarlo Gallino for €3.2 million another polychrome corpus for a crucifix in limewood; this is less than half the size of the Santo Spirito figure. The figure had been previously exhibited in 2004 in the Museo Horne in Florence. ^ Giancarlo Gentilini, Proposta per Michelangelo Giovane. Un Crocifisso in legno di tiglio, catalogo della mostra, Firenze, Museo Horne, 8 maggio - 4 settembre 2004, Torino, 2004.
." Sansovino "several experts have cast doubts on the attribution, with the doyenne of Michelangelo cross studies, German art historian Margrit Lisner, saying it was probably a  ANSA reports that: In December 2009, an inquiry has been opened into the acquisition of the crucifix by the Italian state.